Family trip to Kauai, 50th Anniversary, Hawaiian recipes: Chocolate Macadamias and Shave Ice. So much catching up to do! I came back from a family trip to Hawaii with stories to tell and ideas to share. 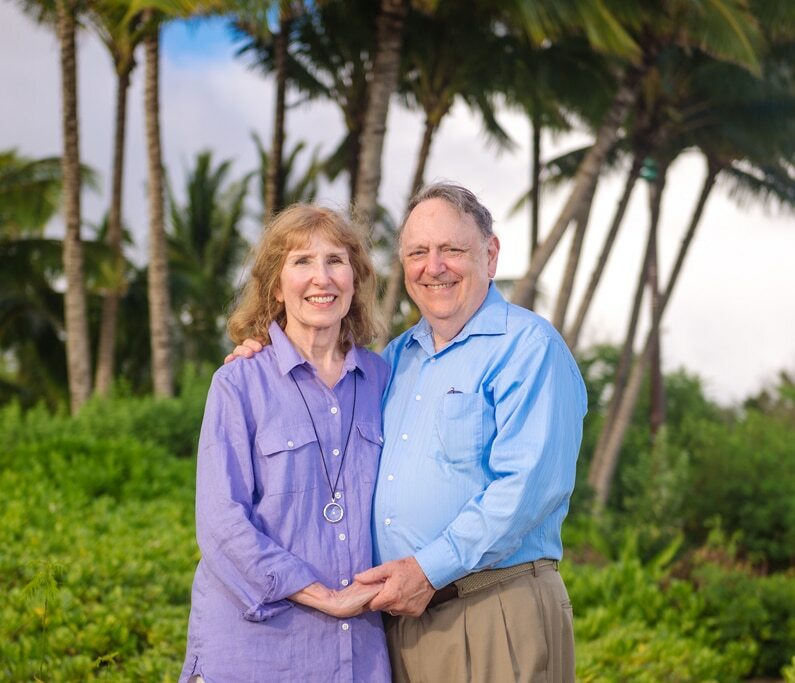 Dean and I celebrated our 50th anniversary in June and our kids treated us to a party while we were all together on Kauai. 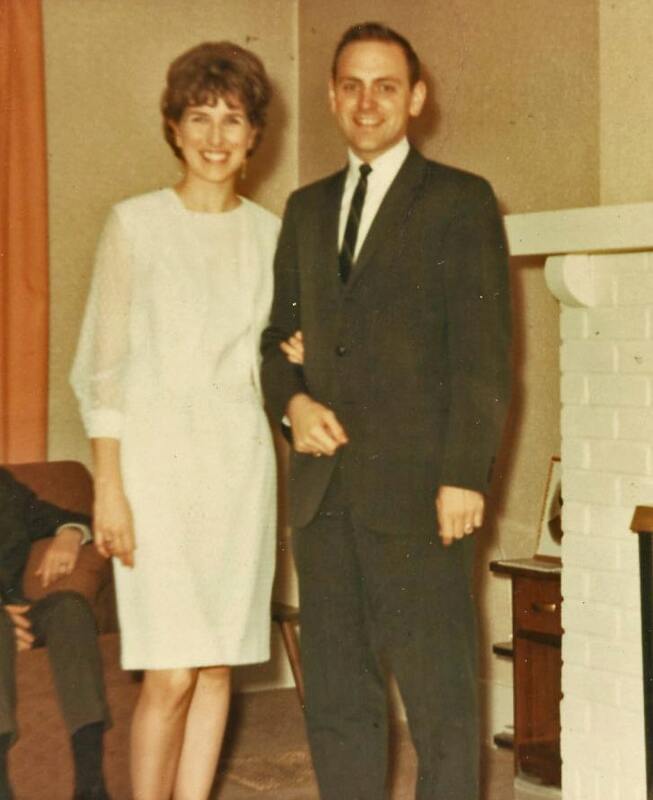 My husband put together a slide show hitting some of the high points of our life together; some that even our kids didn’t know about or remember. The pictures below are the before and after shots of the two of us. 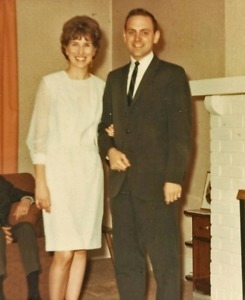 The first picture, taken shortly after we were married, is the closest thing to a wedding picture we have. I had been teaching art in Maryland and Dean only had a few days off from his job as a university teacher in West Virginia. There were only three people at our wedding and one of them was the preacher; you didn’t need witnesses in Washington DC. Here are a couple of mementos he found while digging through our old files for material for his presentation. 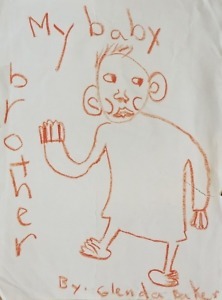 The drawing, which everyone found quite amusing, was done by my daughter when we brought her baby brother home from the hospital. 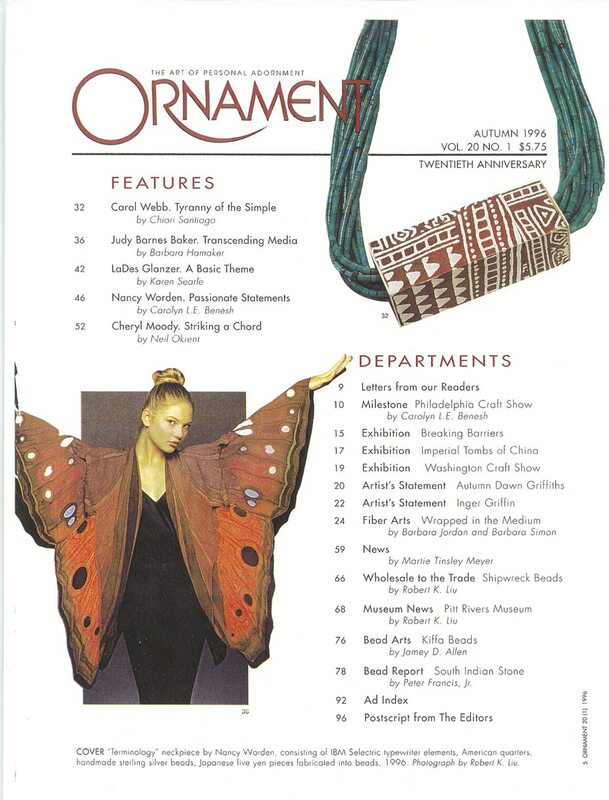 On the right, is the title page of an issue of Ornament Magazine that featured my painted silk capes, ultrasuede wearables, and fiber wall hangings. This was the most ambitious trip I’ve attempted since my allergy meltdown three years ago. My daughter made sure all the eateries at the hotel had a list of things I needed to avoid, which made me something of a celebrity in a not-so-good way. As soon as I mentioned the word “allergies” when placing a food order, the wait staff would ask, “Is your name Baker?” Everyone tried hard to accommodate me and I found a few things at a local grocery, like coconut oil to put in my coffee, but I still lost five pounds in the week we were there, even though I’m trying to gain weight, not lose it! I’m including two simple Hawaiian recipes here and will post a third one, a wonderful Coconut Dessert, in Part 2, as this is already a bit long. Macadamias have been grown in Hawaii for 40 years and have come to be identified with the state. They contain a lot of good fats and only 4 grams of carbs per ¼ cup, 2 of which are fiber. Even when coated with chocolate, they were still the most healthful of the sweets sold in the local shops, and to make matters worse, they were on sale! They were so addictive I had to boost my will-power by promising myself to make some sugar-free ones when I got home. 4 ounces sugar-free, dark chocolate bars, such as Lilly’s, Choco Perfection, or LC-Foods OR use chocolate chips, such as Lilly’s, LC-Foods, or Nevada Manna. Chop chocolate bars, if using. Line a sheet pan with parchment or foil and place in refrigerator to chill. Chill nuts so they are cold and dry when you are ready to dip them. Heat ½ inch of water to boiling in the bottom pan of a double boiler. Turn down the heat so it is hot but not bubbling. (A bowl that fits tightly over a pan can be used as a double boiler.) Be very careful not to get any water into the chocolate or it may separate or seize. Place chocolate pieces in the top pan of the double boiler. Stir the chocolate continuously with a flexible spatula as it melts. As soon as chocolate is melted, remove both pans from the heat. Keep the pan containing the melted chocolate over the hot water. If chcolate is too thick, add a small amount of no trans fat shortening. Add nuts to the chocolate and stir until coated. Dip out nuts and drop on chilled pan. Whole nuts can be dipped out one at a time. 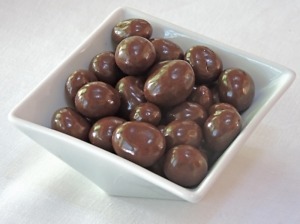 Smaller nuts or halves can be dropped in clusters. Place pan in the fridge to chill for at least 15 minutes before serving. Make half a recipe of the chocolate coating for Chocolate Covered Strawberries using any high-intensity liquid sweetener, such as stevia or monk fruit. Stir in macadamia nuts and continue as in recipe above. Nutrition data for sweetener is not included in counts. 1. To be more like purchased chocolate macadamias, double the amount of chocolate coating. Chill the nuts after covering them with chocolate and dip them a second time to make a thicker coating. Add 3.8 grams of total carbs and 1.7 grams of fiber, which increases the Net Carb count to 3.8 grams per serving for twice dipped nuts. 2. Chocolate melts at body temperature; which is why it melts in your mouth, but it separates or scorches if it gets much hotter than that. A small amount of melted chocolate that stays on the bottom of a hot pan for too long can ruin a whole batch. Keep the heat low, and keep stirring. 3. For comparison, Mauna Loa brand Dark Chocolate Macadamias list 21 grams of carbs, 17 of which are sugar, and 2 grams of fiber per ¼ cup. The iconic frozen treat of Hawaii is called “shave” ice,” (not “shaved”). Dean took this picture while I was holding a rapidly-melting serving of sugar-free, coconut shave ice. So refreshing on a really hot day!! 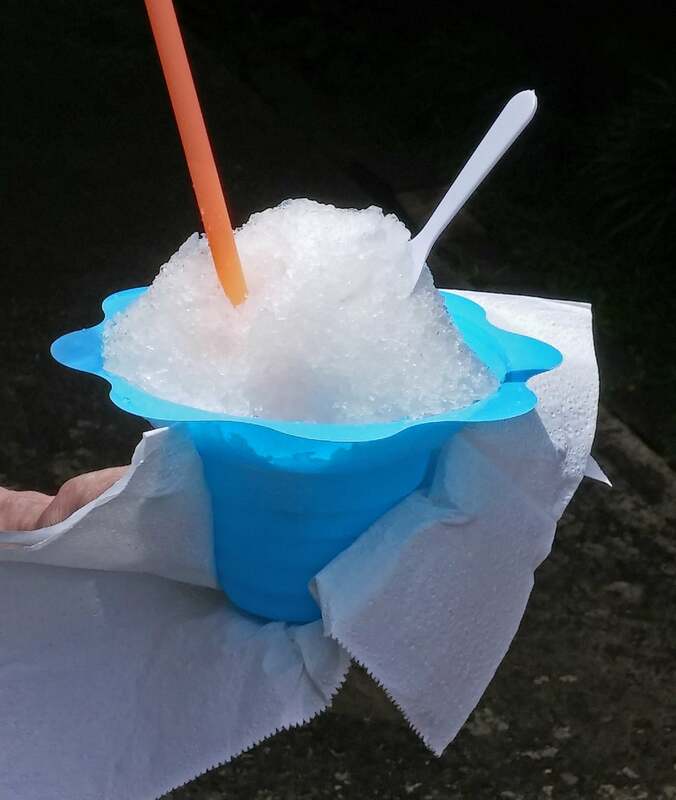 How is Hawaian shave ice different from a snow cone? The ice is finer so the syrup doesn’t drain off leaving plain ice on top with a pool of flavored liquid at the bottom. I have a rotary machine (no idea where I got it, probably a gift) that actually pares thin shavings off a frozen cylinder of ice. It makes a fun project to do with kids but it’s not very efficient. I also have a high speed blender that makes super-fine ice, lickity-split. There’s an easier way yet, but it’s not an option in the summer; use snow. Scoop up shaved ice with a cup and invert into a chilled dish. Pour chilled, flavored, sugar-free syrup, such as Stur, Di Vinci, or Torani over the top until the ice is saturated. Serve at once with a spoon and a straw. Use about 1½ ounces (3 tablespoons) of syrup for 8 ounces (1 cup) of shaved ice per serving. Part 2, Cruise along Na Pali Coast, Allerton Gardens, and Hawaian Coconut Dessert recipe. The working title for my first book was, “You’ll Never Know What You Are Missing.” It summed up my goal: to make eating for health synonymous with eating for pleasure. Once you discover the secret, you will find that the very best food for weight management, longevity, the treatment and prevention of disease, and over-all health and happiness is also the most sumptuous, satisfying, and indulgent way of eating the world has to offer. You are invited to the feast. Enjoy! 5oth Anniversary, Chocolate macadamias, Hawaii trip, Shave Ice, Wedding picture. Bookmark.